This article will briefly show how to setup the ThingMagic USB Plus+ Reader This article can also be applied to similar ThingMagic USB devices. For more detailed information, please see the appropriate Setup Guide for your reader below. In order to install a new USB Plus+ reader, you will need to download the appropriate drivers from the link above. The drivers should be downloaded to a known directory on the computer in case they need to be accessed at a later time. Connect the USB reader to the PC via the provided USB cable. Be sure to plug the black USB-A connector into the PC. If the Power led (PWR on the reader) does not light, plug the red auxillary power USB-A connector into another USB port on the PC. The drivers for the reader will now attempt to install. 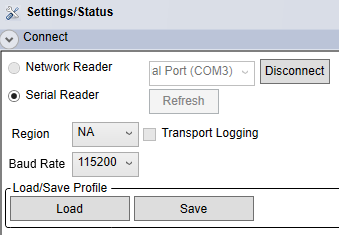 Find the COM port assigned to the reader on your PC. This can be done by navigating to the Devices and Printers section in Control Panel (for Windows machine) and finding the reader there. The USB reader should be listed as something similar to "FT232RUSB UART". 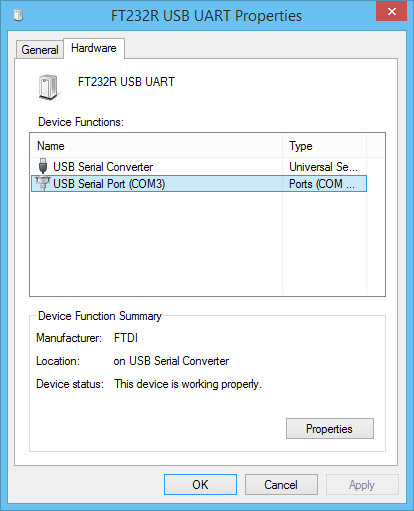 View this device's Properties, and under the Hardware tab, the device's COM port should be listed. Open the Universal Reader Assistant (URA) tool and select the Connect button at the top. In the sidebar that shows up, select the Serial Reader radio button and select the appropriate COM port in the drop-down selector. Once the correct region is set and Connect is selected, URA will attempt to connect to the reader. Finally, navigate to the Tag Results tab and select the Read button. URA should now populate with the tag EPCs being read. 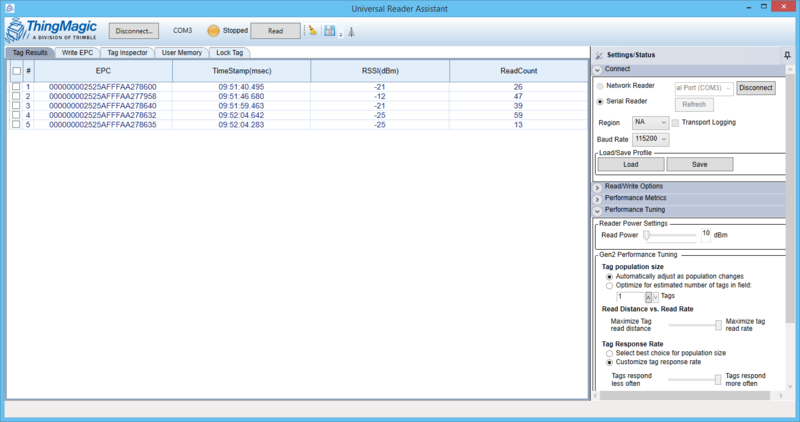 For more information regarding the Universal Reader Assistant tool, please see Using Universal Reader Assistant.